WHEN DEMOCRATS unveiled their landmark elections reform bill last month, Mitch McConnell, the Republicans’ leader in the Senate, slammed it as a “political power grab” designed to “rewrite the rules to favour [Democrats] and their friends.” Mr McConnell’s response to the bill, which included a proposal to make Election Day a federal holiday, reflected Republicans’ tendency to oppose moves to expand access to voting. In recent years this has been especially evident in their support for laws that require voters to show photo identification before they cast a ballot. Democrats have long argued that such laws risk lowering turnout among black Americans, who are less likely to have the necessary identification. And yet, a view is emerging among political scientists that ID laws have not been turning black voters away. Some 34 states have voter identification laws, according to the National Convention of State Legislatures. They vary widely. 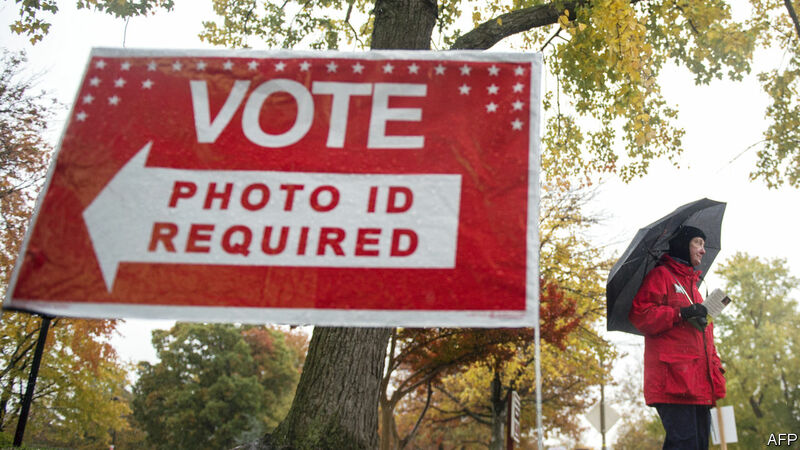 Some states require voters to display photographic identification to vote, others don’t require an ID card to include a photo, some simply request some form of ID but don’t require it. Whether a state has voter ID laws is influenced by two factors, according to a study by Daniel Biggers and Michael Hanmer, political scientists. If a state’s governorship and state legislature are controlled by Republicans, it is more likely to pass such laws. And a state is even more likely to pass voter ID laws if they have large non-white populations. Most supporters justify these laws by asserting that they curb fraudulent voting, but studies have shown that cases of voter fraud are extraordinarily rare. In 2014 an investigation published by the Washington Post found just 34 cases of voter fraud between 2004 and 2014 at a rate of just one fraudulent ballot per 29m ballots cast. Still, laws requiring voters to present photo ID are broadly popular; a Gallup poll in 2016 suggested 80% of Americans favoured them. And yet there is no comprehensive evidence to support the conclusion that voter ID laws reduce turnout among those who are less likely to possess the right ID. In his book published in 2018, “The Turnout Gap: Race, Ethnicity, and Political Inequality in a Diversifying America”, Bernard Fraga analysed administrative voting data over five elections to conclude that, “we do not yet have consistent evidence of a differential, negative effect of voter identification laws on minority turnout as compared to non-Hispanic White voter turnout.” Mr Fraga suggested that the data he used did not allow him to conclude with total certainty that voter ID laws had no effects on turnout. Now a new study has come closer to such a conclusion. Earlier this month, Enrico Cantoni and Vincent Pons, economists, published a National Bureau of Economic Research paper for which they analysed many years of nationwide, individual-level data on voter turnout. This allowed them to identify whether individual Americans’ voting habits were influenced by voter ID laws enacted in their states. They found that voter ID laws not only had no effect on the turnout of black voters, they had no impact on turnout at all. Though the reasons for this finding are unclear, one explanation is that the voters who would be turned away from the ballot box for not having ID never make it there in the first place. Of course, no one yet knows if voter ID laws will have an effect on voter turnout in the future. Given the intentions that too often lie behind them, the laws will no doubt continue to fuel controversy.